Since the Syrian Civil War broke out in 2011 as part of the Arab Spring uprising, Turkey has welcomed more than 3.5 million Syrian refugees, offering shelter, food, health care and education. As a result Turkey was the world’s largest humanitarian aid donor last year in terms of the ratio of official humanitarian assistance to national income at 0.85 percent. 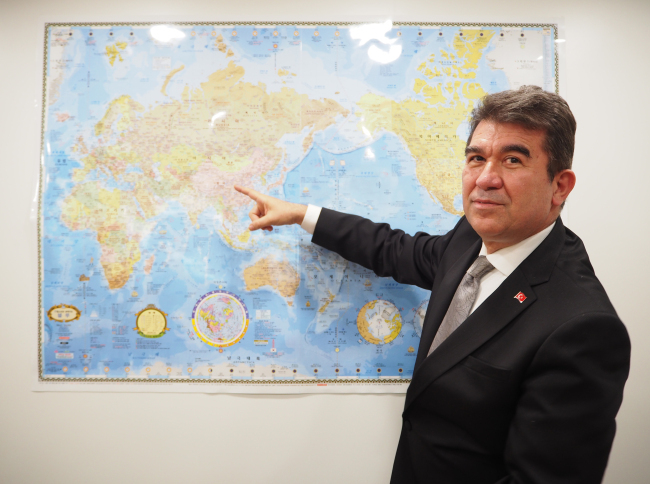 Ankara’s foreign policy prioritizing humanitarian assistance needs more international recognition and support, the top Turkish envoy to Korea told The Korea Herald, adding that his country combines humanitarian and development aid as a long-term sustainable strategy. Turkey’s tradition of being a good Samaritan goes back to the Ottoman Empire (1299-1922), the career diplomat said. Since ancient times, “Turks always opened their doors to people forced to flee their countries in wars, conflicts and other crises.” Jews escaping persecution from Nazi Germany as well as Spain some 500 years ago found new homes in Turkey. Ankara’s foreign policy priorities include strengthening of regional security and stability; deepening and diversifying strategic ties worldwide; lending assistance to those in need by combining humanitarian and developmental projects; and enhancing trade networks, energy security and cooperation at regional and international organizations, according to the Turkish Embassy in Seoul. Noting that development-oriented aid constitutes one of Ankara’s foreign affairs pillars, Ercin said connections needed to be bolstered to increase recipient countries’ resilience and ability to respond to their problems early on. The approach enables affected countries and communities to cushion the impact of humanitarian externalities, and reduces their need for further aid. The Turkish International Cooperation Agency TIKA, Turkish Red Crescent KIZILAY and Disaster Management Institution AFAD have carried out emergency assistance and development projects worldwide. Turkey’s foreign aid for 2017-18 went to Niger, Chad, Sudan, South Sudan, Somalia, Mozambique, Palestine, Yemen, Colombia, Vietnam, Myanmar, Libya, Georgia, Moldova, Albania and Romania. Turkey has spent $31 billion in hosting the 3.5 million Syrian refugees. More than 600,000 Syrian children have received schooling in Turkey and over 20,000 Syrian youths are studying at Turkish universities. The Syrian conflict, now in its eighth year, has claimed the lives of more than half a million people. It created over 5 million refugees and 6 million internally displaced persons, while giving rise to terrorist organizations. Turkey has hosted numerous international conferences and organizations dedicated to peace, dialogue and humanitarian development, including the World Humanitarian Summit; Friends of Mediation Group, with 56 members and four UN General Assembly resolutions; Istanbul Conference on Mediation; UN Alliance of Civilization Initiative, co-sponsored by Turkey and Spain; and Organization of Islamic Cooperation Conference on Mediation.